Paylance is a tool I created for freelance creatives like myself that would protect from late/non paying clients. After waiting several weeks to receive a payment for a presentation I had designed, I decided to build a solution that would prevent this from happening again. I realized it’s a problem that many freelancers face (71%) and results in $6k left on the table annually in the US alone (source). After identifying the problem, conducting a competitive analysis and speaking to a variety of illustrators and designers, I decided a tool to solve this problem could be beneficial to many others like me. The simple solution would be to “protect” the designer’s files by automating the application of a watermark atop the uploaded files that are shared with the client (referred to as “the deliverables”). The unmarked/source files would then become available for download only after payment has been completed by the client. During initial design and development work, the tool was named with a temporary name: WanderApp, I liked the concept that the app was like a magical wand, allowing users to get paid instantly, like magic! When launching in Beta I unveiled the real product name: Paylance. Paylance is a play on words combining freelance+payment, the core function of the product. A sketch from early 2015. I began prototyping the product in late 2014. I decided the best solution was to make use of a client/project structure, where each client would have related projects. This would be beneficial to freelancers that work with recurring clients, which could sort their projects by client. 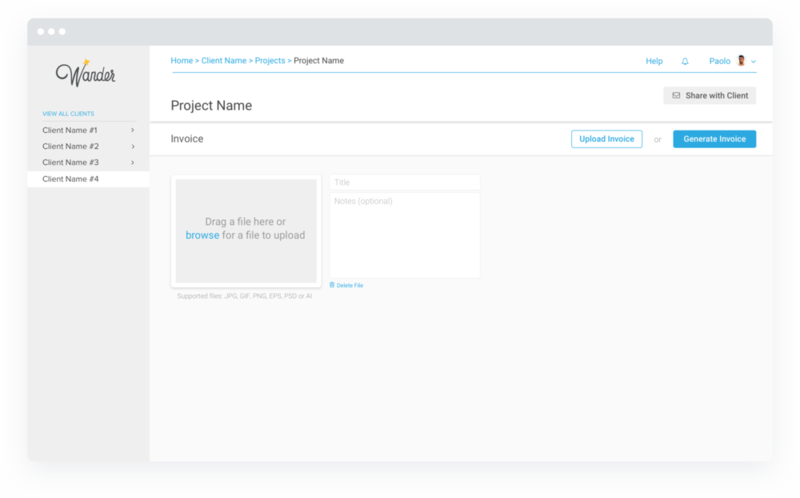 The user could track status of projects (shared with client, paid, unpaid) at a glance via a simple overview page. The tool provided an easy invoice generator too, although this was not the core feature. Very first wireframes of the product (click to view). To gather emails for the alpha waitlist, I created a promo video of the product's flow and features (video below). After polishing the UI and refining the UX, the alpha app was ready to launch. Below is a recorded prototype (the live app is no longer available). The alpha soft launch was conducted by inviting a cohort of 1000 users from the email waitlist. During this phase, signup rate was only 1.3%. User feedback was positive, yet the app appeared to be unnecessarily complex. The client and project managment brought an unnecessary granularity and control to the product, causing the user flow to be tedious and the experience sup-optimal. All this resulted in a loss of focus on the core functionality of the app: file sharing and payments. I decided to iterate and redesign the UX based partly on personal assumptions and mainly on user feedback. The new app would be stripped of the client/projects structure and lose its bulky dashboard-like UX in favour of a more seamless user experience. I returned to the drawing board to address these issues and design a solution. I also opted for the removal of the cumbersome client-project structure. User personas were created and the information architecture redesigned from the ground in an effort to reduce all potential friction. The use of a progress indicator provides the user with a clear overview of what steps they’ve completed and what steps are remaining, reducing frustration and risk of abandonment. Another major UX change was to adopt a lazy registration (or “progressive sign up”), thus allowing users to try the product without needing to sign up immediately. The downside of the lazy registration could be that fewer leads are generated (i.e. fewer emails retrieved). Another improvement was to temporarily store the user info (submitted via the invoice generator), so if the user decided to create an account during that same session, the only info required would be the date of birth. This helps to reduce personal info required in the signup modal, reducing friction, user fatigue and increasing ease of signup by breaking the process into digestible bites. Should the user choose to not generate an invoice via Paylance, the signup modal would be more text heavy as all the required user info would not be known at this point. Signup modal with generated invoice. It is apparent how much lighter the signup process is when the user chooses to generate an invoice through the app. Signup modal without generating an invoice. Inspired by the simplicity of tools like WeTransfer, I created a new version of the app which was lighter and more intuitive. Wireframes of the first version of the simplified and redesigned app. I stripped all visual clutter and noise to nudge the user into completing one meaningful action at a time, each step would contain one single action, which, once completed would unlock the next step. Below is an example how of the upload screen was simplified to the core. The app has a minimal visual style, surfacing only the bare necessary information/UI. Due to my background as an illustrator, I chose to make use of illustration and colorful iconography in popups, to add a layer of color and fun to the otherwise minimal product. The main screen of the app (shown above) makes use of a playful illustration which becomes colored upon hover, suggesting the user to click on it. Themed lineart icons used in the product's modal. The icons in action inside pertinent modals. I believe making use of illustration in digital products is highly valuable as it helps connect with the user on a deeper human level. For this reason I always try to leverage illustration whether it's to design a 404 page, an empty state, a placeholder or just an easter egg. While researching brand colors, I discovered blue is an especially popular color with financial institutions (Paylance is a fintech product), as it conveys a sense of trust. For this reason I chose blue as the primary color for the UI as it is perceived as trustworthy, dependable, and secure. Below are examples of financial institutions and fintech products that use blue in their brand. The final product can be viewed here, the marketing site can be viewed here instead. The prototype of the app can be seen by clicking the image below.